This is music that tells a story of triumph over tragedy. Pieces written and arranged by Holocaust survivor and cello pedagogue Lev Aronson, plus a new, dramatic work for cello and piano and a solo jazz sonata. This CD is inspired by Lev Aronson, one of the greatest cello teachers that ever lived. His tale is an incredible example of triumph over tragedy. Lev had to rebuild his life and cello playing after his internment in the concentration camps of WW II, and as a result of his struggles, became an inspirational cello teacher and performer. Brian Thornton, cellist, conductor and educator has performed in hundreds of venues from The White House in Washington, D.C. to The Great Hall of the People in Beijing, China. As a soloist, he has premiered more than 100 new works for cello and is a champion of modern composers. He has touched the lives of thousands of students through his musical outreach programs in Head Start schools across the U.S. He is the artistic director of The Lev Aronson Legacy Week in Dallas, Texas, an ongoing yearly event that is dedicated to Mr. Aronson's teaching and philosophy of cello playing. 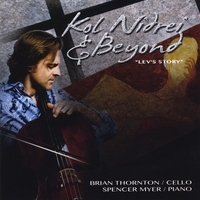 Kol Nidrei and Beyond, Lev's Story, is an ethusiastic look at how the cello can sing and dance, and includes several new and exciting works for cello, as well as cello favorites such as Vocalise by Rachmaninoff and and The Prayer by Ernest Bloch. Inspired by folk melodies the title track, Kol Nidrei, was composed by Max Bruch in the cantorial tradition of the synagogue and combines the tunes sung on the Jewish High Holy Day of Yom Kippur. The Fantasie on Themes in the opera Rusalka by Antonin Dvorak is a musical popourri of leitmotifs that describe the story of a water nymph that falls in love with a human. Included in this unique piece are the opera overature, the witch's song, the dance of the wood nymphs and the famous Song to the Moon. Rachmaninoff's Vocalise has been transcribed for more instruments than any other piece by that composer, and demonstrates the most beautiful, haunting and vocal aspects of the cello. After the war Lev Aronson found that the melodies of the cantorial tradition and Jewish art music had taken on a new signifigance, and his original compostition, Hassidic Dance, is an adaption of well-known melodies that Mr. Aronson must have heard growing up in Latvia in the early 20th century. The Hassidic song Mipnei Ma ends the performance of a play by S. Ansky about a woman who is possessed by the soul of her impoverished lover after her father marries her off to a wealthy man. The lyrics are as such, " Why, oh why did the soul plunge from the utmost heights to the lowest depths? The seed of redemption is contained within the fall." The lyrical and meditative melody of Abodah is based on a traditional chant in the Yom Kippur prayer service that recalls rituals performed by high priests inside the Holy of Holies, the most sacred First Jewish Temple. Mr. Aronson must have been inspried by the beautiful playing of the violin prodegy Yehudi Menuhin, who he heard play in Berlin before the war. Aronson and Marc Lavry were friends in Berlin before the war, and his compostiton Kinereth was originally composed for voice and orchestra in 1939, providing a lyrical melody to accompany Hebrew poet Avigdor Hameiri's lyrics about the beautiful but changable Sea of Gallilee. Sonata Kol Nidrei by Patrick Zimmerli was commisioned by Brian Thornton and was originally planned to be a set of five laments with the Kol Nidrei being at the center, but programmatic nature of the piece soon took hold, and the second movement became a light, rhythmic scherzo. The central movement became a jazz version of the piece by Max Bruch, with a pizzicato or plucked accompaniment in the cello. For the slow movement Mr. Zimmerli wrote a line of purest form, a single vocal melody for the cello that slowly draws the listener forward as a painter might draw a brush. The fifth movement is very fast and bustling, full of double and triple stops, and it's mood is fiery and intense. With the variety of characters set to music, Mr. Zimmerli realized he had composed a Sonata for Cello, the Sonata "Kol Nidrei". Ernest Bloch's Prayer was writen when he was the composer was the director of the Cleveland Institute of Music where Brian Thornton teaches. This compostion builds upon melodies from the Jewish liturgy and evokes through it's simple motive the dissapearance of European Jewery. Lev Aronson also recorded this piece several times during his life.